AMT-PCI-MC4 is a PC compatible multi axis servo and stepper motion control card, giving a high level of protection against noise. 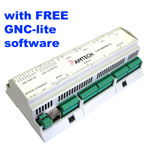 Ideal for industrial applications, with a comprehensive range of software support and a excellent price performance. LAN-Motion is an Ethernet based servo and stepper motion controller. It based on a fast 32-bit RISC processor and floating point co-processor with optical isolation providing a high level of protection against noise. It comes with FREE GNC Lite software.